Step into the enchanting world of the often overlooked in this unique joint exhibition from Julya Hajnoczky and Katrina Vera Wong. 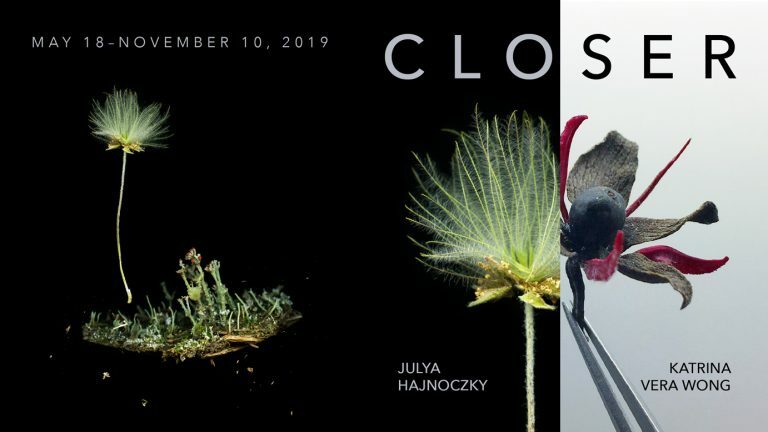 Hajnoczky uses a high-resolution scanner to produce richly detailed large-scale still life photographs of natural specimens like moss, bones, feathers, and leaves, allowing the viewer an unusually close look at each organic object. The detail in the work reinforces the idea of preciousness, and provides the keen observer with the opportunity to slow down and examine the specimens at close range, mirroring the artist’s slow and meticulous study of ecosystems. Using sections of pressed or dried plants, Wong makes flowers that bloom in dark places, and she calls them Frankenflora. After losing her father in an unexpected way, she revisited a poem by Samuel Taylor Coleridge that inspired a different perspective on her art practice. Particularly fascinated with the mutability of orchids, she continues to pursue the creation of a “strange and beautiful flower”. Guided by the study of biology and botany, and influenced by traditional natural history practices, I spend time researching ecosystems and the connections within them, particularly via site visits, and documenting each landscape, using both analogue and digital photography. Following ethical foraging practices, I also collect various specimens of plants, fungi, lichen, and animal material such as bones or feathers to incorporate into my work. The pieces in this exhibition are from an ongoing body of work created using a very high-resolution flatbed scanner: specimens collected during site visits are arranged on the glass, in groupings based on certain constraints. In some cases the items have all been collected from the same location, in other cases they serve to illustrate connections in ecosystems that may not be immediately apparent to a casual observer. In still other pieces, the arrangements may highlight more aesthetic aspects of the specimens – similarities in shape or structure, for instance. These photographs, printed at a very large scale, allow the viewer to get an unusually close look at each specimen. The detail in the work reinforces the idea of preciousness, and provides the keen observer with the opportunity to slow down and examine the specimens at close range, mirroring the artist’s slow process of meticulous study of ecosystems. The overall installation is evocative of the traditional Cabinet of Curiosity (also known as Wunderkammer, or Cabinets of Wonder). These rooms or cabinets, popularized in Europe beginning in the 1600s, were filled by avid collectors with botanical and zoological specimens, geological finds, fossils, and man-made curiosities from all over the world. There was no particular formula for the establishment of such a room – each individual would fill their space based on their own interests and collecting abilities. When people ask what I do, I tell them I make flowers. And I call them Frankenflora. In Samuel Taylor Coleridge’s poem “What If You Slept”, a “strange and beautiful flower” is plucked from a dream in heaven and brought back to our waken world. Years after I first read this poem, after I volunteered at an herbarium, after I became fascinated with the mutability of orchids, after I lost my father, did I begin to understand just how strange and beautiful that flower was. In my grief, I was plunged into a frenzy of piecing together parts of dead flora to create—or replicate—Coleridge’s poetic flower. I consult the study of botany and experiment with the concept of hybridization, using sections of pressed or dried plants to construct a flower, like Dr. Frankenstein and his monster. That hybrid speciation is more commonly found in plants than animals makes them the ideal media for this practice, so Frankenflora (with its variations given binomial names) may represent a species that is perhaps not altogether impossible. The Frankenflora won’t die again but they’re still fragile. In events of loss, we have to be gentle in remembering whole lives. And be careful not to forget them.